Hey everyone! As most of you know, we've been out of the RV for a long time now. Last August we found a property that we fell in love with in Cotopaxi Colorado. It's about a 20 minute drive from the Royal Gorge Bridge and after being here for nearly a year it's really starting to feel like home. There was so much that went into our decision to stop full-timing that I'll have to leave it for another post. I can't believe that we haven't posted here for almost a year!! In some ways, our 8 month adventure in our RV feels like a lifetime ago. Our time on the road was so precious and we don't regret one minute of it. I hope the kids will be able to look back on it fondly as they grow up. That time together is something we'll always cherish. Sometimes it takes time to process different seasons that we go through in life. What did we experience, what did we learn, what was God trying to show us? I can't say I always understand why things happen the way they do... sometimes until years after the fact. We make decisions without always considering the ramifications. One thing I've learned as a Christian is that so much of my life is out of my hands. I can choose to accept that and walk in the Spirit, trusting that God will lead me as I submit to Him, or take the more painful route that is characterized by anxiety, fear, pride and stubbornness. Why do we so often put ourselves through the latter? For the first 6 months or so that we got off the road and came to live in the mountains, I didn't really understand why. Of course we loved it... what wasn't to love? Low cost of living, real peace and quiet, amazing neighbors, tons of time with our family and just space to live. But why? What did God have for us in Cotopaxi the place no one has ever heard of? The peace and quite has brought much needed time for reflection. Earlier this year I came across a quote by Spurgeon that really ministered to me personally. I liked it so much that I decided to frame it and on that same day, Lori pointed out the date to me. It was 125 years TO THE DAY that Spurgeon had preached that sermon where the quote was pulled from. Pretty awesome. The first lesson is that fellowship with God takes preeminence over everything. As a Christian, nothing in your life will be in balance if you aren't pursuing your relationship with God through Jesus in the power of the Holy Spirit. What else could possibly be more important than that in this life? Second, fellowship with other people matters. A lot. As a guy I don't often feel the need to have to be around people all the time. I'm perfectly content to go a week or two just doing my own thing. I have plenty of stuff to keep me busy. But just because I am capable of that doesn't mean is always a healthy thing. I have a lot to learn in that regard and Lori has been showing me by example how much it matters. The single hardest thing about being in the RV was not having regular fellowship with other people and especially other Christians. At first we were so excited and seeing family so much and doing so many amazing things that we didn't think about it all that much. But over time it began to get harder and at times excruciating. When you live in a random RV park for 2 weeks at a time and don't know a single soul for hundreds of miles it can wear you down. I remember one week when we were finally able to connect with another full time family and park next to them for about 5 days. We were so starved for relationships that I think we had dinner with them 4 nights in a row! Long story short, as we started to settle down in Cotopaxi, finding a Church was a big priority. We had already connected with our new neighbors a little bit, and we were now only about 10 minutes away from family we loved, but finding that Church family was super important for us and the kids. We landed at Living Stone Calvary Chapel and have pretty quickly gotten connected. It's been so sweet to be able to connect & serve again. It's been good for our souls... I don't know how else to describe it. My encouragement to people that are planning to full time or are considering it is to take stock of one of your most valuable assets... relationships. In all your planning, which trust me, I know can be extensive. Make a plan for how you will connect with other people on a very regular basis. There is so much more to tell and we have some major ministry updates to share, but those will have to wait until a future post. Thanks so much for all your prayers last year! We care about each of you so very much and if we haven't heard from you in a while, please drop us a line. If you'd like to get away into the mountains for some peace and quite, come and visit us. We have a small guest cabin and comfy RV for you to stay. What a month it has been! Out of rainy Colorado and back into dry & hot California. After we left the mountains above Canon City late in May we were kind of over the rain. We spent two months in Colorado visiting family, attending work meetings, going to the doctor, dentist, etc. It seriously rained about 75% of the time! Still, we really enjoyed out time there and the time with family and friends. We even had a run in with some snow as we headed over Wolf Creek Pass above Pagosa Springs! After spending a couple of nights in Durango we made our way Southwest and hit Mesa Verde National Park. It is a must see if you are ever near southern CO.
From there it was on to Grand Canyon National Park for a couple of more days. Lori and I hadn't been there since we were kids and I'm pretty sure we enjoyed it quite a bit more than the girls. It's true what they say, pictures truly don't do it justice. Whew... and that was just the first week of June! After the Verde Valley we headed back to one of our favorite campgrounds in Southern CA, Lake Skinner just in time for Abby's 8th birthday. Being that she wants to be a scientist when she grows up, of course she wanted to go to California Science Center for her birthday. My mom & dad joined us for the day and we all had a blast! Birthday balloons from Gigi & Papa! BTW, if you've never been to the Science Center in L.A. You have to check it out. It is FREE. The space shuttle is incredible and they have some amazing IMAX movies as well. Right now the Dead Sea Scrolls are there on display!! Yes, this month has been quite an adventure. Next we're headed up to Santa Barbara for my sister's wedding and then starting our journey to the east coast. The last few months have been really exciting for Agape Bags. We were able to distribute roughly 200 bags in the great Denver area to places like Open Door Ministries & Restoration Outreach among others. We held a successful event at Calvary Chapel Fort Collins where we tested out the "Operation Christmas Child" model of handing out empty bags and asking people to fill them up with items on a list and then bringing them back to the Church for distribution. We've also been getting a steady stream of online orders from around the country which has been really encouraging. Our biggest challenge recently has been finding partners that are willing to work with us to get bags filled, and more importantly distributed. We currently have about 1,250 bags & Bibles in stock as well as 250 toiletry kits. Whenever we get enough money together, we buy the food & supplies to make the complete bags ourselves. Our problem has been trying to find Churches, outreaches & ministries that are willing to accept the bags. I know it sounds crazy but it's true. If you have any connections with a ministry that does active outreaches, please get in touch with us or help make an introduction. We don't want to have to sit on available inventory for so long. It needs to get into the hands of individuals that need help! Another idea that has been on Lori's heart for quite some time has been to figure out a way to distribute Agape Bags internationally. We've specifically been praying about Honduras and working with Churches there to make bags for kids. We believe that the bags can be a great vehicle to reach just about any need and to share the love of Jesus. Lastly, if you attend a Church that has been looking for a very simple way to start an outreach or minister to people in need (at home or abroad), we'd love to talk to you. We can help you run an event or come run it for you at your Church. We provide all materials, bags and Bibles FOR FREE! Thanks again for your love and support. God has been so good to bring people into our lives to encourage us at just the right times. We're blown away by His faithfulness and grace towards messed up sinners like us. Haven't posted since February... oops! The answer to those questions changes on a seemingly daily basis. We have good days and bad. When we don't force ourselves to get outside everyday things can get pretty rough. If we're cooped up for a few days because of bad weather and the kids are close to killing each other we we're not exactly stoked to be living in 300 sqft. When we miss Church one weekend, or are just struggling to make connections, or just need a friend to talk to, or haven't been reading our Bibles & praying enough, we can get down in the dumps pretty quick. But enough with the doom & gloom. On the other hand, life on the road is awesome. No, seriously. We've been able to see and experience so many amazing things. We've been able to visit family and old friends and so much more. The ability to pick up your whole house and move it is pretty liberating. One friend described our family as "agile". That part is pretty sweet. I think one of the reasons that we've been struggling on and off for the last few weeks is that we've been staying in the Denver area and been leading a semi-normal life. Translation: we've been crazy busy with appointments, work and responsibilities and trying to do that while living in the RV has been really difficult. When we leave CO in a couple of weeks it's going to be bittersweet. 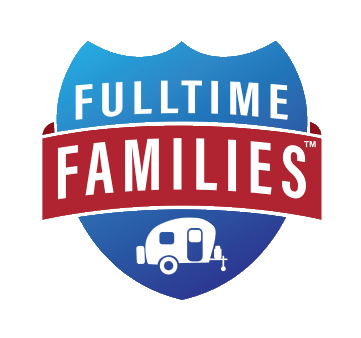 We're going to miss family and friends again, but we're really looking forward to getting back to our normal RV family schedule. There is something about stripping your life down to the bare necessities that is good for the soul. Is it annoying to have to figure out where we're going to laundry this week? Totally. But at the same time it makes us incredibly thankful that we have enough quarters to even do it or that we have so many clothes that we don't even have to do laundry every week. Simplifying your life has a way of making you thankful for the little things. We're thankful that we get to spend so much time with our kids every day. We're thankful that we have food in our bellies (too much actually), a roof over our heads, warm beds, money for propane, gas, etc, etc, etc. We've been meeting a lot of families lately that have been taking the plunge to simplify their lives. We had the opportunity to have 2 families over for dinner while we've been in Colorado that are both actively planning to greatly strip down... one family is planning to live in an RV like us and the other wants to build a tiny house. It's inspiring to meet families that want to get out of debt, spend more time together, and live more intentionally. In terms of an update on where we've been & where we're going you can visit our schedule page for the specifics. The basic plan is to head back out to the west coast in June/July for a big family trip to Catalina and my sister's wedding in July. Then, we plan to make our way out to the east coast for the fall. As some of you know, we've been kicking around the idea of buying a house in the mountains above Canon City, CO. The idea would be to have a sort of home base that we could come back to every couple of months. We've been trying to figure out if it would be better to wait until later this year or do something in the next couple of months. There is a half-finished log cabin that we fell in love with that would require a few months of work that we are still thinking about. The goal would be to have it done by the fall of this year. The current plan is to see if we can qualify for a construction loan on the cabin and if not wait until the end of the year. In terms of Agape Bags, we've never been busier. In fact we're going to have to do a separate post to go over all the cool things that have been happening. We've been able to distribute 750 bags since February!! Life on the road can be really fun and exciting but really lonely too. Being in Colorado has made us realize how many people love and care about us out here. There were key people that encouraged us during our most difficult days. You know who you are! Our number one prayer request is that we can continue to find fellowship on the road and be faithful to reach out to family and friends to keep those relationships going. Even though we don't consider ourselves missionaries, we totally know how they feel in terms of craving fellowship! Praise: The annual homeschool testing for the girls went really well! It was a huge encouragement to see their progress. Praise: We've been getting bombarded with Agape Bags activity. Orders, Church events, etc. It's exciting to see what God is doing! Praise: The Christian Real Estate Network has been crazy busy. April was a record month in terms of referrals assigned to Christian agents since our re-launch in 2010. God is changing our hearts to view this as the ministry it is. It has the added benefit of supplementing our income. It's an amazing blessing and we're excited to see what's going to happen this year. Request: That we would finish this homeschool year strong. We officially only have 4 more weeks! Request: That we would follow God's leading on the timing to settle down into a house. Specifically that we would have wisdom regarding the log cabin we're considering right now. Request: That God would open up doors for Agape Bags throughout the west coast as we travel through the area in June & July. Thanks for reading this very long post. Sorry for the delay in getting it out. The few weeks since I wrote last have been an amazing experience. Full of adventures, disappointments, milestones and breaking points. We have been able to do so much over the last few weeks it's hard to remember everything. We stayed at RV parks along the coast of California and saw some incredible things. We stayed in Pismo Beach and were able to go play at the beach almost every day after work and school, went to nature museums, saw the monarch butterfly migration (awesomeness), caught up with some old friends for dinner at the RV and attended Calvary Chapel Arroyo Grande. Then it all broke loose... Literally. In one week we had the window covering on the door break, the shower curtain rod fell on two separate occasions and knocked me in the head, my espresso machine stopped working, the pantry doors broke apart and shattered the mirror, one of our hydraulic jacks failed, the bearings in our little Honda Fit had to be replaced, and then the leak... The pipes in the bathroom for the fresh water were slowly leaking all the way to the living room. Thankfully it was the fresh water line... Ummm yeah. It ended up being broken in 4 places! Thankfully Justin's parents welcomed us with open arms while we were ironically homeless and got it all repaired last week. But, we finally got in our AgapeBags order and can now start the distribution process! We miss all of our friends and family dearly and are so excited to see you all in April when we are back in Colorado for a bit. Please pray for us as we are trying to figure out how to distribute our 500 starter bags and for all those "day to day" things like work, school, and safety while traveling... and that our eyes will be fixed on our calling and not our circumstances. Lots of great beach days. 75 deg in January! Monarch butterfly migration in Pismo Beach was amazing! Our RV park in Morro Bay was steps away from this! Overlook above the Morro Bay Natural History Museum. Everyones first ride on a cable car in San Francisco! Awesome day at the Exploratorium with Uncle Chris! Private tour of Mrs. Grossman's Paper Company. Wow... in the middle of our 3rd week on the road full-time but it feels like we've been doing this for 3 months. Such an amazing adventure so far. We've had some good days and bad days, but all in all we are settling in to this new lifestyle just fine. Our first RV park turned out to be a great place to start. Plenty of room for the kids, really nice facilities, great heated pool that we had all to ourselves each time we used it, nice staff at the front desk that were very accommodating especially with all the mail we had delivered... It was all around a great place to stay. Abby & Lily doing crafts in our "front yard"
Abby getting her ears pierced. She was so brave! During the 2nd weekend in Buellton, my mom & dad came up from Orange County to spend some time with us. Even though we were fighting colds all weekend we had a great time and our first night with houseguests went surprisingly well! Santa Barbara Zoo with Gigi & Papa. Wet & rainy but still a lot of fun! Update: Made our first official big move on Friday from Buellton to Pismo Beach. One of the biggest lessons from moving days is that they always take longer than you expect. This move was only a 45 minute drive away and by the time we were all set up again it was after 4pm! We enjoyed a nice quiet day today going to Church at Calvary Chapel Arroyo Grande, playing at the park with the kids, and getting some RV projects done while watching football. Thanks to everyone that has been praying for us and checking in via phone, email & Facebook. We really appreciate it! Please pray that doors will be opened up to share Agape Bags with Churches over the next couple of months. We just placed our largest order today for 1,000 starter bags and are looking forward to getting them distributed! New pictures coming soon. By the way, the Schedule page is now populated with some future dates. If we're coming to your area please get in touch so we can visit! We are on day two with just our little family in our little RV, parked somewhere in the hills above Santa Barbara. Honestly, I am wondering what in the world just happened. We don't have cell phone service here or internet so this had given me much needed time to reflect on this. Yesterday, I (Lori) woke up in a terrible mood. Not sure why exactly... Maybe because I have been waking up in a near panic that the propane is going to run out and we will all freeze or the one of the kids is going to fall off their bunk bed. Then I wasn't able to get my coffee maker working... Those that know me know that this is a BIG deal. So... Anyways, I grudgingly got in the car with the kids fighting in the super tiny back seat of the Honda "Fit"(another story) headed out the door to drive 45 minutes to go to Calvary Chapel Santa Barbara. I kinda had a pity party all the way to church as my caffeine headache was kicking in. Justin lovingly drove me to the nearest Starbucks... Probably out of fear for the safety of humanity. Then it happened... God softened my heart and reminded me of what we are doing. As I approached the door the Starbucks I nearly ran into a young man who was clearly homeless and then noticed that there was a group of homeless people just hanging out right in front of Starbucks in the middle of beautiful Main Street in Santa Barbara. Then I go in and there was literally 5 more inside the store at 8:50 amon a Sunday. Wow. At least 12 people in need right in front of my face as I was sulking in to buy my over priced coffee before going to church. God has a funny way of getting my attention! The message that the guest pastor was teaching was titled "Blessed with a burden". He was talking about being all out for Jesus and being obedient in what God had placed on your heart to do! God is so good to give you exactly what you need when you need it! Please pray that we will not be so focused on what we "need" to do for ministry that we neglect our own personal relationships with the Lord and that the start up of homeschooling will go smoothly also that we will be flexible! Pulling out of our cul-de-sac. Our sweet neighbors came out in the cold to give us a send off. All situated and ready for the trip! Made it safely to Orange, CA! 70 deg & beautiful. Prepping for our first day of full-time living! Arriving at our first campground in Rancho Oso above Santa Barbara! We used to go on road trips all the time. During which, I would always be so focused on the destination... it would be all about how we could get there as quickly as possible. I can't count the number of times we've done a shotgun run from Colorado to Orange County CA. We would drive through the night and usually make it in about 16 hours. I see this as a kind of metaphor for my life. Sometimes I can get so wrapped up in focusing on a goal or a future event that I completely lose sight of what I should be focusing on in the "here and now". I've lost whole days/weeks/months of my life wrapped up in the planning for or expectation of some future event. Why? Why is it so easy to run quickly through life and miss the good stuff? It's one of those flaws in myself that I'm painfully aware of but have been so far unwilling or unable to address. While we all have goals and things in life we aim for, if you really look at the sum total of your life, it's the small "in between" stuff that really matters. Was I too busy today to stop and pray? Did I spend time on the computer working that one evening when I really should have been just enjoying time with my wife? As we've been sitting down to write out some goals for our (not so) little adventure, this topic has really been on my mind. One trend I've noticed with other fulltiming families is that many seem to start off with a really aggressive schedule. They would move their home on wheels every few days, try to cover a couple thousand miles each month, and just see as much as possible. But, over time, realized that they had fallen into the trap of not enjoying the stuff in between and eventually decided to start slowing down. We don't want to make the same mistake. in fact, our goal for the first 60 days or so is to hardly move at all. Once we travel into some warmer weather, the goal is to stay put for a few weeks at a time to simply get used to life in a small space and really just enjoy each others company. Our ultimate desire is to just slow down a little and start enjoying life a little more. More time together as a family, more time with God, more time thinking about and focusing on what really matters in life. It may be a big dream and an unrealistic one, but nevertheless, it's a dream... and one we hope to realize very soon. Just have to get this dang house rented. After looking at and researching RVs for a year and a half, we finally pulled the trigger and got one. I still look out the window into our driveway multiple times per day to see if it's still there and not something I just dreamed up. To make a long story short, we got a dream deal on a 2008 Damon Outlaw and it was something we just couldn't pass up. It's a really rare model to find in Colorado and there are only about a dozen used units at any given time for sale around the country. So last week we drove 1,000 miles to La Crosse Wisconsin to go pick it up. Talk about a nerve wracking trip. The thought kept going through our minds... "are we really driving this far to buy an RV we haven't even seen yet?". It seemed crazy, but it paid off in the end. We got an RV that was in almost "like new" condition. Kept in a garage that was custom built just to house it. Got a dolly to tow our van as part of the deal, and got to work with a great seller that really took his time with us. We honestly couldn't have planned it better. Everything from the finances, storage, condition and more have just fallen perfectly into place. More updates to come soon. We're doing our best to get on the road officially by December. I was browsing Amazon today and came across a book title that caught my attention. 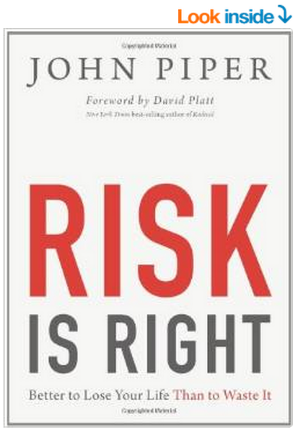 "Risk is Right" by John Piper. A choice lies before you: Either waste your life or live with risk. Either sit on the sidelines or get in the game. After all, life was no cakewalk for Jesus, and He didn’t promise it would be any easier for his followers. We shouldn’t be surprised by resistance and persecution. Yet most of us play it safe. We pursue comfort. We spend ourselves to get more stuff. And we prefer to be entertained. We are all tempted by the idea of security, the possibility of a cozy Christianity with no hell at the end. But what kind of life is that really? It’s a far cry from adventurous and abundant, from truly rich and really full, and it’s certainly not the heights and the depths Jesus calls us to. Sleep-in for 20 more minutes or read my Bible? Get extra hours in so I can make more money, or spend some quality time with my wife & kids? Watch tv or read a book? The list is endless really. Boiled down, it involves any of my time that is sowed to the Spirit as opposed to sowing to the flesh. As it relates to ministry and the bigger decisions in life, it can really become difficult. Our motives get so muddled in the distractions of life (Jer 17:9). We build walled gardens with layer upon layer of security built in. But how can Christians honestly reconcile this kind of lifestyle with the life that Jesus lived? Matthew 16:25 For whoever desires to save his life will lose it, but whoever loses his life for My sake will find it. 26 For what profit is it to a man if he gains the whole world, and loses his own soul? Or what will a man give in exchange for his soul? 27 For the Son of Man will come in the glory of His Father with His angels, and then He will reward each according to his works. I wrestle with these topics on a seemingly daily basis, and the verse that I'm reminded of often is "to whom much is given, much is required". If you are a Christian living in America, we need extra wisdom in this area. We desperately need to wake up and realize that we were not placed on this earth to fulfill our own pleasures. We were placed here to fulfill God's purpose for our lives. To bring Him ultimate glory. Take risks. Step out of the boat. And don't just step out tentatively like Peter did the first time. JUMP out of the boat with all your clothes on like Peter did the 2nd time! What do you have to lose? Sell the house or rent the house? Store our stuff or get rid of everything? Sell our van or store it? Buy a tow vehicle or wait? 5th wheel or class A? Residency in Colorado or South Dakota? Although we've owned an RV before (pics below). Things are obviously very different this time. The idea of putting practically everything you own into a 200-300 sqft. space with 3 kids is pretty daunting. Will we go crazy in the tight space? I guess we're about to find out. Needless to say, we definitely need some prayer as we work through all of these decisions. Our first RV was a 30ft 2002 National Sea Breeze. We seriously loved that RV and put about 20,000 miles on it in 3 years. We have many fond memories of camping by the beach, traveling around to different Christian music festivals for the Christian Real Estate Network, and taking Lori's grandma and grandpa on various trips. It's easy to get restless as we work through all of these details, but we're trying to remember that God is in control and that He's called us to follow Him even when we don't understand all of the details. Welcome to our new blog. Wow... it's been a crazy ride so far and we aren't even on the road yet. For those of you who haven't figured it out yet... Yes, we are planning to go on the road full time in an RV in December this year. That is roughly 200 days from now. It's pretty scary when you put a number on it like that. The primary purpose of the year long trip is to help Churches do online ministry better and to promote a ministry to the homeless called Agape Bags in more urban areas. Serve 25 Churches with their online ministry needs in one year (2015). Create & distribute 2,000 Agape Bags to individuals and Churches nationwide. Blog weekly on ChurchSEO.org to provide free online marketing resources for Churches. Blog weekly on AdventureinFaith.org about our traveling adventures. Have an awesome time with our family traveling and visiting new places!